A short FP this week. Just time to recommend the book I'm reading just now. At The Water's Edge by John Lister-Kaye. Despite the title it's not a fishing book. It is based on the authors journals from a life lived in the Scottish Highlands. This is nature writing at its best. Frequently I find that nature writers tend to overdo the descriptions somewhat. There's a limited number of times you can bang on about â€œthe golden orb descending slowly and inexorably into the pewter seaâ€� and when it's laid on thickly reading a whole book of this stuff is like wading through treacle. Hard work. Lister-Kaye does a lovely job of avoiding this pitfall. 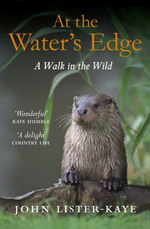 With his stories of wild cats, pine martens, red deer, ospreys, and otters, he captures the feel and spirit of the highlands perfectly, and at the same time grounds us in our position in the world. His uncompromising love of the natural world doesn't blind him to its cruel and unforgiving nature. The world is fantastic in its own right and we don't need to ascribe human motive and emotion to it to enhance it any further. If you like good writing and clever ideas, and you're interested in the natural history of Scotland, I heartily recommend this book.